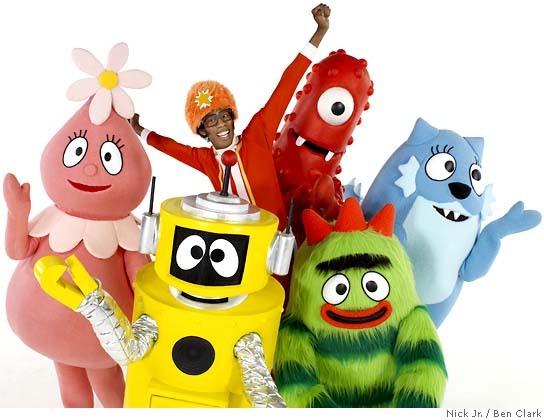 Yo Gabba Gabba is the creation of W!ldbrain Entertainment, who have to be one of the coolest multimedia companies I’ve encountered. Based in LA and NYC, these guys make TV shows, films, adverts and merchandise, and have partnerships in place with Nickelodeon and Disney. As well as being an educational and visually stimulating show, I think it’s a great example of how content powers commerce, with W!ldbrain capitalising on the strength of their creation through “apparel, accessories, books, electronics, games, home décor and toys, available at retail through top licensees”, including their Kidrobot stores (clever, huh? ), “Spin Master, Ltd., Simon & Schuster, Nickelodeon Home Entertainment and Paramount Home Entertainment, Nickelodeon/Sony BMG and others” (thanks Wikipedia). This kind of integrated commercial thinking takes true advantage of today’s twisted media landscape, subverting pre-existing norms of content creation and ownership. For example, a recurring musical segment in the show features The Aquabats, a superhero-themed rock band fronted by the show’s creator. The Aquabats have now been awarded their own W!ldbrain-produced TV show – so it’s evident these guys are all about through-the-line thinking. What a modern company – W!ldbrain, I salute you. Mobile multimedia capabilities are increasing in uptake and potential, but the small form-factor we so desire in our handsets are beginning to inhibit a rich user experience. The typical mobile screen size is 320×240. If your mobile has a pico-projector, it will be able to emit high-res imagery onto any suitable surface, up to 50″ in width. This unlocks the full immersive power of your mobile web browser, 3D games engine, DivX movie player or video conferencing. 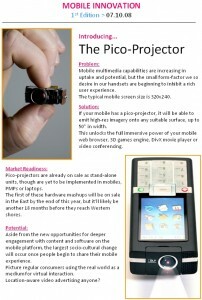 Pico-projectors are already on sale as stand-alone units, though are yet to be implemented in mobiles, PMPs or laptops. The first of these hardware mashups will be on sale in the East by the end of this year, but it’ll likely be another 18 months before they reach Western shores. Aside from the new opportunities for deeper engagement with content and software on the mobile platform, the largest socio-cultural change will occur once people begin to share their mobile experience. Picture regular consumers using the real world as a medium for virtual interaction.